Landing page experience is a major factor in how well your ads perform and how often visitors complete your goals, but it is often one of the last elements in Quality Score that gets an update when people aren’t converting. We all do it. We look at the ad copy and the keywords first because they’re the easiest to fix. You can change those all you want, but if the landing page doesn’t do it for the user, the conversions aren’t going to happen. Google AdWords tells us to focus on the “Big Three” factors that affect ad quality which include ad relevance, expected CTR, and landing page experience. Let’s focus on the landing page portion and get to work finding your major offenders. Log into your Google Analytics account and set your date range. Make sure it’s longer than 2-3 weeks. Click on AdWords in the left sidebar. Click on Final URLs in the dropdown menu. Click Secondary Dimension (right above the chart) and choose Keyword. Scroll to the right side of the page. Under the Conversions drop down, choose your goal(s). If you’re advertising for all of them, pick All Goals. Sort the Bounce Rate column from most to least so you can see all of the pages people are landing on and leave most frequently. Change Sort Type to Weighted to focus on higher traffic pages with high bounce rates. Export these pages into Excel or Google Sheets to better manage them. Note: Your header column should look the image below before you export. Sift through your spreadsheet and notice the pages and keywords that have high bounce rates (above 70%) and little to no conversions. Ignore blog/news posts and About pages. It’s unlikely that people will convert on these. You might see some high CPCs. This can be also an indicator of pages that need attention. Take a short quiz to help determine which pages need the most help! Heather gives some great tips to keep in mind while going through this process. There are some good tidbits and template designs to help you get a better sense of how to format a landing page for conversions. Sometimes the problem is very obvious, but if you’re not entirely sure you should consider A/B testing. These are tests that allow you to set up a duplicate of a landing page with just a few differing elements. For example, you might change the headline or color of your CTA button. Then, some of your users are served Page A (the original) while others are served Page B (the test page) and you’re able to determine the page elements that work best. We all like to believe in our personal experiences and gut reactions to how a page should be designed or organized. Running an A/B Test is great for us, because it will either validate our initial impressions and tell us that the problem might be elsewhere, or it will show us that we may need to consider changes. There are a few great tools that can help you with conversion testing. We really like Optimizely right now, but all of the tools in that list are very helpful (and free or freemium, which is always a plus). If you’re concerned about your boss’ lack of interest in A/B testing, this blog post on how to sell CRO to your boss might come in handy. 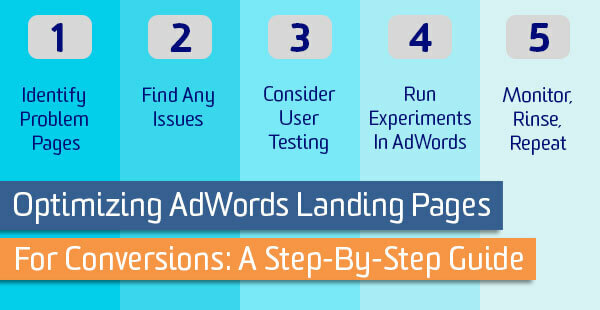 Another way to test your landing pages is to run conversion experiments in AdWords. It’s really easy. Pick a problem landing page from your list. Use one of the free CRO tools to set up an alternate landing page that has different content/experience. Go to the ad group in your AdWords campaign that contains ads for these pages. Duplicate one of them and change the URL to the page you’d like to test against. You should have 2 ads that look exactly the same. They will have different final URLs though. One will be your original page and the other will be the test page. Let these run for at least 2 weeks. Preferably 1 month. You’re never done optimizing and that’s a good thing. You should always be looking for ways to improve. Keep pushing forward and finding what works best for you.